ARLINGTON, Va.–To better protect warfighters during live-fire training, the Office of Naval Research's (ONR) TechSolutions program has sponsored the development of a new Google Maps-style software tool to map out training areas in great detail. 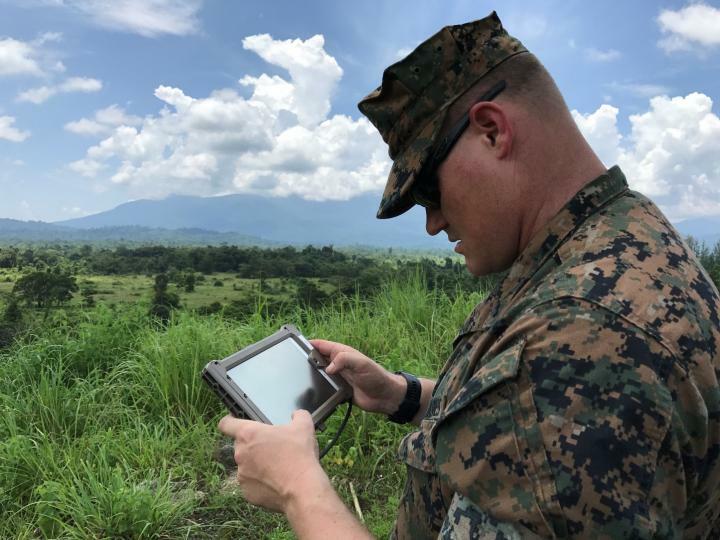 This "geospatial-awareness" tool is designed to plug into the U.S. Marine Corps' KILSWITCH–the Kinetic Integrated Lightweight Software Individual Tactical Combat Handheld for Android. Usable on Android tablets or smartphones, the KILSWITCH application gives Marines real-time situational awareness via graphic displays similar to Google Maps, but without having to be connected to a server. KILSWITCH's existing mapping capability will be enhanced by the TechSolutions-sponsored software plug-in tool–called KILSWITCH SDZ. The tool can map the surface danger zone (SDZ) of any live-fire exercise. The SDZ is the designated ground, sea or air space where munitions like bullets or mortar rounds might ricochet, bounce, skip or splash before or after hitting their intended targets. The KILSWITCH SDZ plug-in creates a two-dimensional rendering of a surface danger zone by overlaying the anticipated exercise area with current satellite imagery of the surrounding landscape. This enables planners to know the locations of weapons and other dangers, and keep warfighters out of the line of fire. "Because the KILSWITCH SDZ tool is handheld and portable, warfighters can plan live-fire training while in the field versus from inside of a command center," said ONR Command Master Chief Matt Matteson. "They're able to walk the ground and see graphic representations of weaponry, which improves planning efficiency–especially when plans change suddenly." Marines can use the KILSWITCH SDZ plug-in to not only create and save surface danger zone maps, but also share them with other linked-in participants–building a real-time database of warfighter movement and weaponry placement. "KILSWITCH SDZ is valuable during actual live-fire exercises, but it also can be implemented during the early planning stages beforehand," said Rick Sams, who manages the project for the Explosive Ordnance Disposal Technology Division at Naval Surface Warfare Center Indian Head (NSWC IHEODTD), Maryland. "The KILSWITCH SDZ system allows the user a much more efficient means to develop training and certify surface danger zones, saving time and resources," he continued. KILSWITCH SDZ originated in 2015 when a Marine Corps infantry officer contacted TechSolutions–ONR's rapid-response science and technology program that develops prototype technologies to address problems voiced by Sailors and Marines, usually within 12-18 months. TechSolutions then partnered with the Naval Air Warfare Center Weapons Division, Digital Precision Strike Suite, to develop the tool, and with NSWC IHEODTD, to conduct training and engage operational forces. Marines recently tested approximately 20 KILSWITCH SDZ plug-ins at multiple training exercises–including those in preparation for next year's Cobra Gold event, an annual multinational military exercise held in Thailand. Sams hopes to see the tool distributed widely throughout the Navy and Marine Corps in 2018.